Andy Rothman, China Macro Strategist for CLSA believes so. In this video he summarizes the misconceptions surrounding the China growth story. On the other side sits Michael Pettis who has asserted for sometime --long before it was fashionable-- that the Chinese investment driven growth model cannot continue without an internal rebalancing. Pettis fleshes out his case and the counterpoints in this post titled "Debating growth in China" from his website. Also entering the fray this week is a useful post --notwithstanding its lack of copy editing-- from Wang Chen and Chen Long, graduate students at Peking University, whose riposte to CLSA'a Rothman is titled "Debunking misconceptions on China?" and is part of the China Seminar at INET. This blog is sympathetic to the bearish view and it does not buy into the drivel that the BRIC's will lead the globe out of a long period of subpar growth. Equal time will be devoted to critiquing the other BRIC members but for now a serious reflection of the China story should be addressed. Can the CPC maintain its grip at the cost of continued exploitation of the majority of Chinese or will it --like its military-- rot from within as argued by John Garnaut in Foreign Policy. Are there truly capital controls in China, or is the reality (as stated by FT in light of the Bo Xilai case of luxury apartments in tony Knightsbridge) one of circumvention? 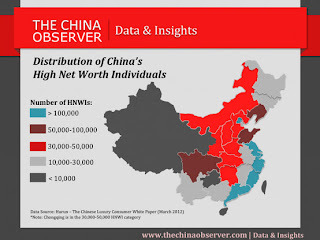 Chinese citizens are restricted to exchanging no more than $50,000 of foreign currency each year and are supposed to be taxed on their global income. Senior Communist party members are barred from unauthorised international travel and are not supposed to own assets abroad. But, in practice, many officials have secreted large fortunes outside the country. Source: Financial Times: "Bo Xilai bought luxury London flats"
For the China growth story to be sustainable the spoils of economic prosperity must be shared. This is not the case at the moment.